Eva LeWitt makes injection molds with muffin pans in her Lower East Side studio. Eva LeWitt works with soft materials such as plastic, latex, rubber and polyurethane foam to create hanging sculpture and wall pieces, the materiality of which dissects space and plays with notions of depth and mass. LeWitt studied painting at Bard College before finding sculpture at the very end of her studies. In the decade since graduating, a continued patience and prolificacy have emerged in her practice, situating her in a lineage of sculptors working with soft material such as Eva Hesse and Maren Hassinger. A key element of this lineage is how the work gains significance through manual labor and the ability to work by hand. “Soft materials are the ones I want to touch and I want to play with; they are physically more impressionable than stone, wood, metal. They are also less subject to a prescribed technique, which has freed me up to be inventive, impulsive,” says LeWitt. 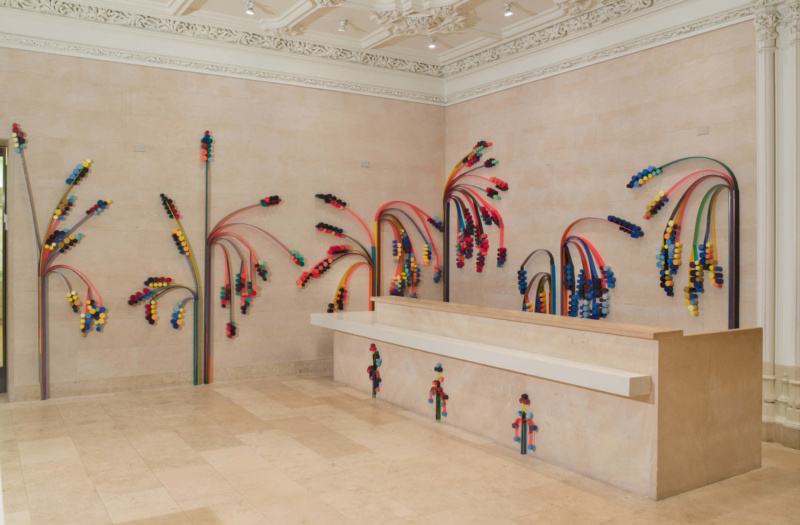 Installation view of the exhibition “Eva LeWitt,” November 2, 2018—March 19, 2019, The Jewish Museum, NY. Photo by Jason Mandella.